The blue background of the panel is part of the doona cover from their bed. 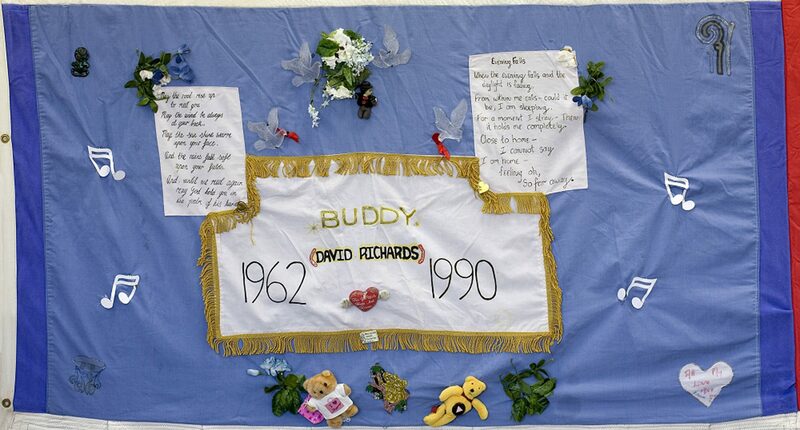 In the very centre is a smaller calico panel which has his nick-name ‘Buddy’, his full name is David Richards, and the dates of his birth and death. The red stuffed heart between the dates is the first thing that Buddy ever bought for Alex. The Charlie Chaplain figure, the clown brooch, and the gold fringing around this centrepiece represent the couples “warped sense of humour” and the fun times they shared together. A button pinned close to the clown brooch says, ”when you love someone you love him as he is.” It is a reminder that close to the flippant side was this more serious aspect of Buddy’s nature. Buddy loved music, and the white metal musical notes scattered around the panel are Christmas decorations he bought for a tree that they never got to use. The two teddy bears symbolise different experiences. One teddy with his legs crossed recalls a time when they were both in the hospital together and were constantly being told off for lying in bed with their legs crossed – not good for that circulation! The other teddy says, “I love to shop”, a favourite pastime for both Buddy and Alex. There is a poem called ‘Evening Falls’ written by Buddy himself; and a favourite Celtic blessing was given to Alex by his mother as her contribution to the panel. Buddy’s favourite flowers, white roses, are included and also white doves for peace. In three of the four corners, there are Maori symbols. In the top left corner, there is a Tiki, top right a Maori symbol for peace. In the bottom left corner, there is a moko because Buddy “loved getting into a frock” and that represents the drag queen and entertainer side of him. And finally in the bottom right corner a heart with a love message for Buddy. Alex says that this panel is a celebration of his time with Buddy.